The Universe is (Mostly) Flat! The universe looks pretty much the same close by as far away, whichever direction we look. (The technical terms are homogeneous and isotropic.) That means we can break the universe up into relatively small cubes and study one box as a stand-in for the entire cosmos. I hope it crossed your mind to wonder if breaking the universe into cubes is fully justified. After all, we know that gravity changes the shape of spacetime: that’s the centerpiece of Einstein’s general relativity. As it happens, the cosmic box picture need not be correct, but it is because of the geometry of the universe. The three possible geometries for a homogeneous and isotropic universe. They are the four-dimensional extensions of spherical, Euclidean, and hyperbolic geometries, respectively. The names refer to whether initially parallel light trajectories converge (close), stay parallel (flat), or diverge (open). Last Friday, I highlighted an episode in the history of mathematics: the discovery of non-Euclidean geometry. We looked at three possible types of geometry: spherical, hyperbolic, and Euclidean (or flat). I had an ulterior motive in focusing on those three, excluding more general scenarios: they correspond directly to the three possible geometries of a homogeneous and isotropic universe! (I’m talking about the universe at the size of the cosmic box and larger. Galaxies, stars, planets, and the like dominate on smaller scales.) The universe isn’t a two-dimensional surface, so the spheres and hyperboloid shapes I showed aren’t exactly right: we need the four-dimensional version of a sphere and hyperboloid, which are beyond my ability to draw (at least under my current pharmacological regimen). However, the basic behavior is the same, even if the names and numbers of dimensions aren’t the same. In a closed geometry, initially-parallel lines converge on each other, just like in spherical geometry. In a flat spacetime, parallel lines stay parallel forever; this is also known as Lorentzian geometry, since the presence of time in spacetime gives it a different behavior than Euclidean space. In an open spacetime, initially-parallel lines diverge as in hyperbolic geometry. Only in the flat, Lorentzian spacetime do our cosmic cubes really make sense. This is because the light would converge or diverge when crossing the universe, meaning our simple picture would have to be modified. The sides of the boxes wouldn’t really be flat, so a grid wouldn’t be possible in the usual sense. We could still have some kind of box, but its appearance wouldn’t be as simple, and I’m not entirely sure how I would draw it. Thankfully, I don’t have to! We can justify the cosmic box because the universe is flat. Before inflation, the cosmic boxes weren't cubical or the same size. Inflation pumped energy into each box, smoothing out the differences and making them flat-sided and uniform. With the basic contents of the universe (matter, light, dark energy), if the cosmos starts out closed or open, it will become more strongly closed or more strongly open over time. However, that’s not what we see: the universe appears to be very flat, which means either the universe is perfectly flat, akin to balancing a unicycle on a tightrope, or we’re missing a piece of the puzzle. However, as I mentioned in Part 3, the very early universe didn’t look much like it does today: it was messy and chaotic, far from being either homogeneous or isotropic. Temperatures fluctuated wildly from place to place, and maybe one patch of spacetime would exhibit open geometry while a neighboring patch might be closed. But there was another component that doesn’t play a role today simply because the universe is too big: quantum fluctuations. When the universe was very young, it had high density, so the physics of the small could effect the entire universe. These fluctuations pumped energy into the cosmic boxes, causing them to expand rapidly, a phenomenon known as inflation. Inflation occurred when the universe was about 10-34 seconds old, and shut off after about 10-32 seconds (give or take: we’re talking about a tiny tiny tiny fraction of a second, no matter which figure you use). During that minuscule interval of time, each cosmic box grew 1042 times larger: that’s a 1 with 42 zeros after it. Let that figure sink in for a moment. Inflation smoothed out the differences in the separate regions, and even if the universe was not flat on average beforehand, inflation made sure it was pretty close to flat afterwards. 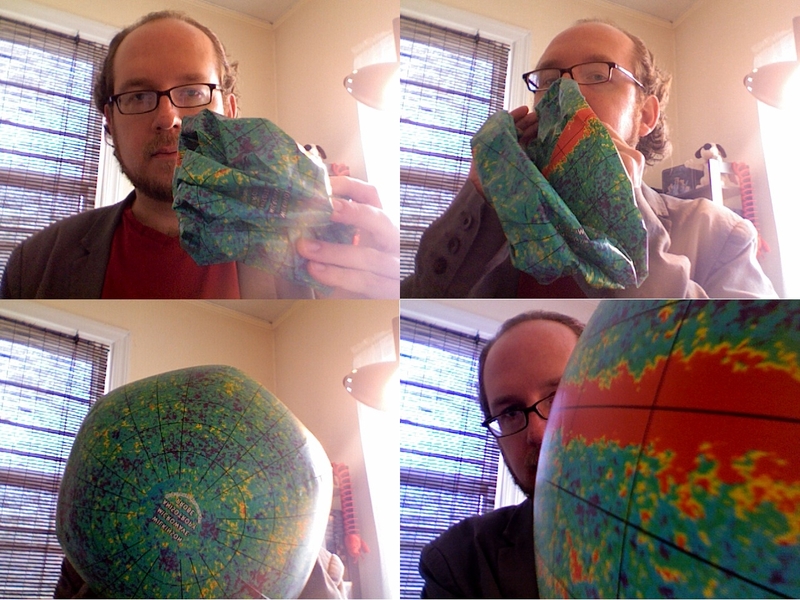 The elegant photocomic below illustrates that using a beach ball…though as always, remember that the universe isn’t expanding into anything—each cosmic box is growing larger. The ball begins wrinkly and small(er); the energy from quantum fluctuations is supplied by my lungs, turning a shapeless lump into a smooth surface. 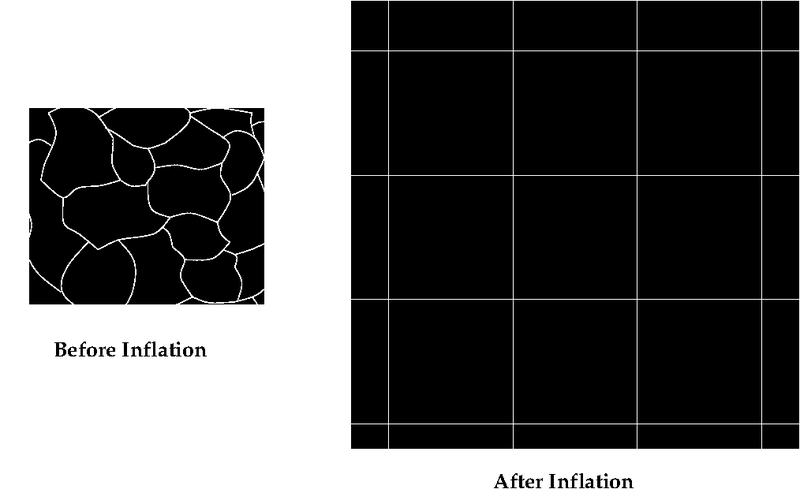 The last panel shows a closeup when inflation ends: you can see that even though the surface is curved, it appears flat on the scale we care about. So it is with the universe: it may not be perfectly flat, but close enough. The results from the WMAP satellite are consistent with the universe being slightly open, slightly closed, or perfectly flat (which is highly unlikely!). Inflation illustrated using a beach ball. Initially, the geometry of the universe is messy, but inflation smooths out the differences in separate regions, making everything the same. After inflation ends, the universe will be mostly flat, though you’d have to zoom in closer than I was able to do with this particular beach ball (or just get a bigger sphere). Inflation also ensures that temperatures are the same across the universe: two regions that were close together when the universe was very small are now widely separated, thanks to the rapid expansion. Two widely-separated bits of the cosmos are the same temperature now because they used to be next to each other, and inflation was too rapid for them to change! Thus, inflation solves the problem of why the universe is mostly flat and why it is the same temperature on the largest scales. It’s an impressive intellectual achievement. Yesterday marks the anniversary of the conception of inflationary theory: on December 6, 1979, cosmologist Alan Guth realized he could resolve the “flatness and horizon problems”, as they were known then by introducing a new quantum field. To mark the occasion, Davide Castelvecchi interviewed Guth; go read the interview. I’ll wait. The modern version of inflation isn’t quite the same as Guth’s original scheme, but it’s not sufficiently different that I need to tell you all the ways it has changed over the last 32 years. I also have lied to you: inflation hasn’t fully solved the problems I mentioned for the simple reason that there isn’t a single inflationary model agreed upon by the community. I’d say most cosmologists accept the big-picture view of inflation as correct: inflation did happen, but how it actually worked is still a matter of some debate. The Wilkinson Microwave Anisotropy Probe (WMAP) measurements have ruled out some of the more exotic inflationary schemes, but it leaves a lot of options to choose between. Before you ask, I don’t have a preferred inflationary model. Inflationary cosmology isn’t my area, so I can remain aloof and scoff at their petty struggles unbiased. However, like Ethan Siegel, I do think inflation as a concept is more likely than the other options out there, so lack of consensus over the details of inflation don’t bother me too much. Inflation simply answers too many questions that another model must also take care of; that seems a stretch to me. So while you’ll see cosmologists fighting over which version of inflation is correct (eternal inflation vs. multi-field models vs. other schemes), relatively few argue over inflation vs. another idea entirely. Since I departed from my original order of posts, I won’t predict which topic I’ll cover in the next installment, but I have at least two more posts still to come: the Cosmic Microwave Background and the large-scale structure of the universe. I hope you’re enjoying the ride thus far.